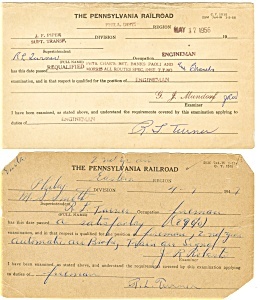 This item is a lot of four (4) Pennsylvania Railroad Employee Examination Results Forms dated 1946,1947 (2) and 1956. About one employee who started as a Fireman and progressed to Engineman in 1956. A neat item from the Railroad.They do show their age, slight damage on a few but generally in good condition.